﻿ Electric Fireplaces: Are They the Best Option for You? Home » Electric Fireplaces: Are They the Best Option for You? If you are thinking about adding a fireplace to your home and want a low-maintenance and budget-friendly option, you should consider an electric fireplace. One of the best things about electric fireplaces is that they do not need a chimney or other venting system for installation, so you can add a fireplace anywhere you wish, even in your outdoor living space. They also do not require a gas line, which can be quite expensive to install. You can even move your electric fireplace from room to room. Bart Fireside is proud to offer our customers this type of fireplace as a choice, and we would like to tell you more about electric fireplaces, their benefits, and why they could be the best option for you. How do electric fireplaces work? Do they provide a lot of heat? Installing an electric fireplace is simple; all you have to do is plug the appliance into any standard 120 volt outlet. As for heat output, electric fireplaces are available in different sizes. If you would like to heat a larger area, there are appliances that provide up to 4,500 BTUs that can heat an area up to 450 square feet. To figure out how large of an area an electric fireplace can heat, The HomeSource for HomeAdvisor tells you to divide the number of watts by 10. For example, an electric fireplace with 1500 watts can provide a sufficient amount of heat to an area up to 150 square feet. What are the benefits of electric fireplaces? You do not have to store firewood, clean up ashes, or other chores associated with wood-burning fireplaces. Nor do you need access to a natural gas line. Using an electric fireplace is simple and convenient. You just plug the appliance in and turn it on. Some models even come with a remote control that lets you adjust your fireplace from the comfort of your couch. Since there is no chimney involved, you do not have to worry about heat escaping out of that vent. 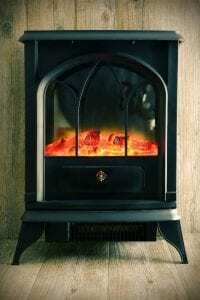 The heating efficiency of electric fireplaces is much higher than the typical wood-burning appliance. If you have younger children, you will appreciate the safety of electric fireplaces. The glass fronts of these appliances are made from “safe to touch” glass, so you do not have to worry about your kids burning their hands if they touch the fireplace doors. You also have no risk of chimney fires, and you will never have to watch out for a fire getting out of control. Are there any downsides to electric fireplaces? If you love the sensory experience of a wood-burning fireplace, you may be disappointed with the flames of an electric fireplace. You also have to be careful when shopping for these appliances and be sure the electric fireplace you want is capable of providing the amount of heat you need. Interested in learning more about electric fireplaces? Contact us at Bart Fireside if you think this type of heating appliance is the best option for you. I am interested in having an electric fireplace installed in my great room. But I have many questions. I want a black framed insert at least a 50″ long with a blower and a remote. I have book cases on both sides and the tv sits in the middle on a shelve. I do not want a mantle. I want it installed under the shelve below the tv. Is this possbile? Should I send you a picture? I live in Camden so I don’t want to waste your time or mine. What do you suggest? Thank you for your time. We would need to know a few more dimensions about your available space to be able to recommend some options – namely the height and depth of the available space in addition to the width. We do deal with a few companies that do nice electric fireplaces so chances are that we can find you something that might interest you if you are still looking.